I exhibited the project in the Künstlerhaus Bethanien gallery from October 8 – 31, 2015. During the duration of the exhibition, the interns concurrently working in the office of the KB (Livia Tarsia and Catarina Pires), performed their assigned office duties within my exhibition space, which for the purposes of the exhibition I transformed into a semi-private office space. Livia and Catarina were both enthusiastic about the performance process, and took a collaborative role in interacting with exhibition visitors. 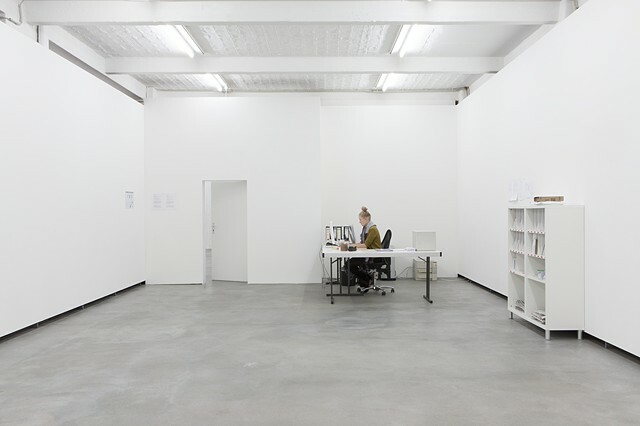 They worked in the gallery during the overlap between office and gallery hours (between 14h and 18h Tuesday – Thursday, and 14h and 16h30 on Fridays), speaking with visitors should they have questions, but for the most part, performing the duties they normally would undertake in the KB’s administrative offices. All furniture in the exhibition was provided from the KB’s own storage, and office supplies were taken from the administrative offices. Funds to divide the exhibition space into an office were redirected from allocations for the artist’s (unused) publicity budget.